With the Congress having suffered in the recent Assembly polls on account of bitter infighting and rampant indiscipline, its president Sonia Gandhi today sent a stern message to party cadres to present a united face. Jharkhand Chief Minister Arjun Munda, his wife Meera and four other persons had a miraculous escape when the helicopter carrying them developed a technical glitch and crash-landed at the airport here today. The Augusta A 109 C crash has again raised pertinent questions regarding safety and maintenance of helicopters flying in the country. Convicted Punjab Agriculture Minister Tota Singh today submitted his resignation to Chief Minister Parkash Singh Badal on moral grounds. His resignation was forwarded to Punjab Governor Shivraj V Patil, who has accepted the same. The Punjab Cabinet now has 16 ministers including the Chief Minister, two short of the maximum strength of 18. US President Barack Obama on Tuesday heaped praise on Punjab-born Dalip Singh Saund, the country�s first Indian-American member of the Congress. 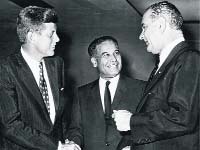 Dalip Singh Saund (C), the first Asian-American elected to the Congress, flanked by US President John F. Kennedy (L) and Vice-President Lyndon B. Johnson. It was like a bolt from the blue that struck cross-LoC trade. 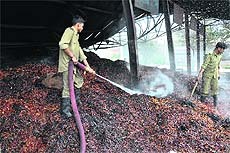 PoK-bound merchandise, mostly dry chillies, worth Rs 2.5 crore was gutted in a major fire at Narwal Mandi here last night.